Report by Stefaan Verhulst and Andrew Young: “Across the world, significant time and resources are being invested in making government data accessible to all with the broad goal of improving people’s lives.Evidence of open data’s impact—on improving governance, empowering citizens, creating economic opportunity, and solving public problems—is emerging and is largely encouraging. We know that we cannot simply focus on releasing open data, nor can we build a portal without understanding its possible uses and demand. Yet, we often do just that. Understanding and meeting the demand for open data can increase overall impact and return on investment of public funds. 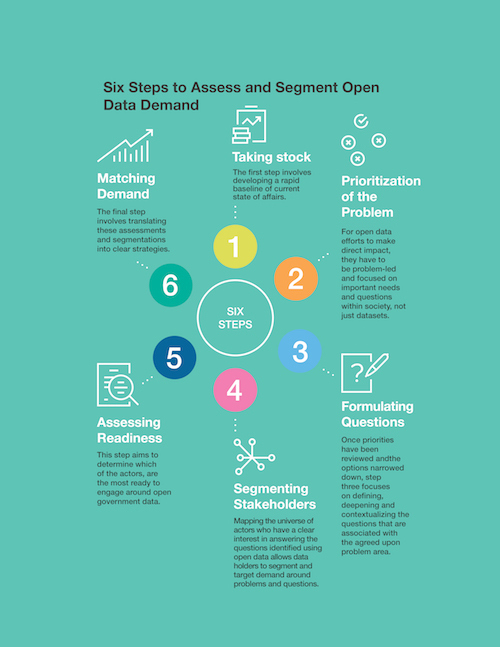 The GovLab, in partnership with the Inter-American Development Bank, and with the support of the French Development Agencydeveloped the Open Data Demand and Assessment Methodology (Beta) to provide open data policymakers and practitioners with an approach for identifying, segmenting, and engaging with demand. This process specifically seeks to empower data champions within public agencies who want to improve their data’s ability to improve people’s lives…. (More)”.